this is a blog called geometricsleep. : It's a beautiful day! In celebration of the first beautiful day of spring in NYC (I'm crossing my fingers that it'll stay like this), here's one of my favorite editorials ever from an April 1995 issue of Vogue, featuring the lovely Kate Moss. I was 11 when this came out. This picture of her with the shopping cart has remained one of my favorites ever throughout the years. It always seemed to capture the perfect mood of being young and having fun in the summertime. In my head she is going to the supermarket to get the treats for her day at the beach. I SO wanted to be this cool when I grew up. And even though it's a beautiful day here in Brooklyn, sunny days always make me a bit nostalgic for my beautiful little island of Puerto Rico. I miss the sound of the waves and the smell of sea salt. Hopefully I'll go back soon. 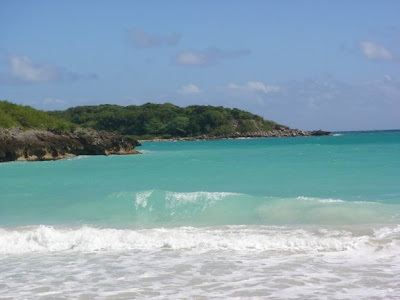 Playa Garcia in Vieques, Puerto Rico taken by my lovely friend Thais. Don't you want to be there too?